Manchester has given birth to some of the most exciting artists of the Rock era including Buzzcocks, 10cc, The Stone Roses, Davy Jones, The Chameleons, Van Der Graaf Generator, Inspiral Carpets, Herman’s Hermits, Simply Red, The Hollies, The Fall, Magazine, 808 State, James and, of course, Oasis and The Smiths (and that’s just the tip of the iceberg!). For every Manc band that achieved great success in other parts of the world, there are many that did not, although that has nothing to do with their talent or influence on the city’s thriving music scene. Dislocation Dance is one of the finest and most influential bands to emerge from Manchester yet they remain relatively unknown outside of the UK. While it may be presumptuous to say that they had a big hand in creating the Indie, Post-Punk, Twee and Alternative genres, they were certainly at the forefront of those scenes back when the Punk movement kicked open the doors ushered in a new era in Rock music. 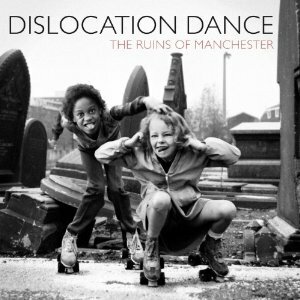 Formed in November of 1978 by singer, guitarist and songwriter Ian Runacres, Dislocation Dance always did things their way while not realizing that ‘their way’ was going to influence the next generation of Manchester bands. DD’s sound was rough around the edges but was a unique and melodic blend of Pop, Jangle, Jazz and Funk. Their live shows and stunning array of songs helped the band ink a deal with local indie label New Hormones (which was run by Buzzcocks and their manager Richard Boon). The band released their first EP on the label in 1980, followed by another EP in ’81 and then finally their debut album, Music Music Music, that same year. Sounding like no other band at the time, their musical output was so varied that they could have easily aligned themselves with the Postcard Records scene (Aztec Camera/Orange Juice) as well as the Post Punk (The Fall/Durutti Column/Crispy Ambulance) and Punk Funk (Higsons/Pigbag/Rip Rig & Panic) scenes. But alas, Dislocation Dance chose to travel their own path and, even though they didn’t cross over to the mainstream, they created some of the most engaging records of the early ‘80s. After signing with Rough Trade in ‘82 and releasing a handful of stunning singles, the band finally unleashed their second album, Midnight Shift, in 1983. Again, Dislocation Dance sounded like no other band, which didn’t help them commercially. Though the band received plenty of critical kudos and toured throughout Europe, they failed to connect with a larger audience. Through it all, though, younger bands were paying attention and were inspired and moved by what the band accomplished both live and in the studio. Sadly, Dislocation Dance called it a day in 1986. It’s hard to pinpoint exactly why the band didn’t achieve greater success. Perhaps it was their ever-(r)evolving line-up that often-times would include a female vocalist sharing duties with Runacres. It also could have been the band’s desire to stretch themselves musically, creating an eclectic catalog that confused the casual listener (yet still sounds fresh and exciting to this day). Or maybe it was the fact that the band never signed with a major label? In any case, the band may not have become a household name, but they did inspire many successful bands including The Smiths, James (DD’s horn player Andy Diagram has been a long-time member of James) and, indirectly, Oasis. As luck would have it, continued interest in the band encouraged Runacres to reform Dislocation Dance in the new millennium. That line-up of the band recorded the Cromer album in 2005. 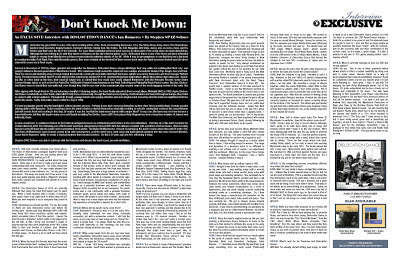 The following year, LTM Records went back and properly reissued DD’s first two albums complete with a plethora of bonus tracks. More recently, Runacres took DD back into the studio and recorded their 2012 platter, The Ruins Of Manchester. Instead of picking up the band’s sound where they left off in the ‘80s, The Ruins Of Manchester (and Cromer) sounds fresh and contemporary, as if the band never went away and had naturally matured into this more focused direction. Leave that to Runacres’ ability to create a musical moment that remains timeless. He did it 30 years ago and he’s still doing it today. SPAZ: LTM have recently released your latest album, The Ruins Of Manchester, packaged together with your 2005 album Cromer. How are you feeling about this release and everything leading up to it? IAN RUNACRES: I’m really excited about the new album. Ruins was a lot of fun to make and it was great collaborating with new musicians. The initial responses have been really positive. I’m also really pleased that Cromer will reach a new audience, too. I’m very proud of that album. The songs are lovely and it has some of my best ever guitar playing, plus Andy’s, (Diagram), trumpet, flute, violin, soprano sax, mandolin and ukulele; it’s a very organic sound. SPAZ: The Dislocation Dance of 2012 are sonically different than when the band first began over 30 years ago. When a band reunites after a couple of decades, fans expect them to go right back to where they left off. Were you ever tempted to try to recapture that period in time? IAN: Interesting you should say that. For me, the songs on Ruins are very Dislocation Dance and reflect my writing style. Having said that, Midnight Shift (1983) did have those ‘80’s drum machines, synths and reverbs, which somewhat place it that time period. I guess I’ve lived through a transition, which might not be apparent to the old fans, in that I wrote and recorded a couple of albums with my other band, Brightside, in the ‘90’s, called Slide & Dive and Snakes & Ladders, plus Shinjuku Junction and Cromer, as Dislocation Dance, in the ‘00’s, for Vinyl Japan. So there’s a lot of stuff out there which fills the gap. IAN: Manchester was an extraordinarily wonderful place to be in the early ‘80’s. In fact the new album makes reference to it. When I say wonderful, I guess have to put it in context: the City had very high levels of deprivation; it had the infamous Moss Side riots; there were constant threats of IRA bombs, some of which were realized; the Factory Club had just opened and Post Punk was flourishing. Surprisingly, there was a huge amount of optimism. I was very active in the Manchester Musicians Collective, working with other bands to organize and promote gigs; share sound systems; manufacture compilation LPs and so on. It was through the MMC that I trialed a pre-Smiths Mike Joyce as a potential drummer and where I met Andy Diagram (later recruiting him as my trumpeter). The music scene was a real community, with a genuine fondness between bands across labels and styles, with loads of cross overs. We played in each other’s bands; I particularly liked to step in as a bass player and even had the interesting experience of being Nico’s bassist, for a short stint. SPAZ: Where did the band’s name come from? IAN: Alliteration! Everyone was at it in the early ‘80’s. Actually, what interested me was being musically accessible, but with a subversive content. I still feel the same, as you may hear on new songs such as “Hang Fire”, which is pretty dark. I’ve always liked the idea that you could both subscribe to and challenge the pop song convention; ideally all within one song. SPAZ: While some bands from the era may have been easily classifiable, Dislocation Dance were most certainly not. What were the influences, musically and otherwise, that helped to shape the DD sound? IAN: Yes. I know. Not being classifiable was probably commercial suicide. Geoff Travis wanted to promote us as Manchester’s Aztec Camera, when he signed us to Rough Trade, alongside the Smiths. The Smiths, however, made his job a lot easier, by having a consistent and easily recognizable sound. A brilliant sound, too, of course. We, I think, were much more difficult to market, as every single sounded like a different band. Having said that, I simply couldn’t help myself. I was listening to Dr Buzzard’s Original Savannah Band, Burt Bacharach, Chic, Pere Ubu, Scritti Politti, Talking Heads, Iggy Pop, early Gong, TV & Film music, Eric Satie, Holst, Charlie Mingus and, of course, I grew up listening to The Beatles. So what chance was there of writing in one style and sound? SPAZ: There were many different sides to the band, musically. Did you see the band as ‘different’ to what was going on around you? IAN: If you’re a genius, you can create a distinctive and unique style; but there aren’t many of those in the world. At the other end of the spectrum, some just copy one particular style, even though, in some cases, they do it really well. I can’t do either. I get bored too easily to just have one approach to writing and like always like to try something new. I’m certainly influenced by whatever I’m currently into, but rather than copy, I like to let the essence seep in. It’s musical osmosis. Besides, no matter how hard I try, I just can’t write a normal song. That was one of the most exciting things about the Post Punk days; there was an understanding that you didn’t have to conform, you didn’t have to please a major label (although, that might have been a good idea, in retrospect), and you could be true to yourself. It’s true, though, that Dislocation Dance weren’t like other Post-Punk bands, nor did I want us to be. SPAZ: You are linked to many of Manchester’s greatest bands such as Buzzcocks, James and The Smiths. Was it true that Morrissey was a big fan of your music? And for the uninitiated, what was your relationship with Buzzcocks and James? IAN: Pete Shelley (Buzzcocks) was our guest vocalist when we played at the Factory Club, as a treat for Tony Wilson. Pete asked me out, afterwards, but I declined and he never sang with us again. Tony wanted to sign us, but as I’d ended up sharing a house with Richard Boon, the Buzzcocks’ manager, we were firmly bonded to New Hormones, (easily as good a label as Factory, but with no capital, to invest, ha ha). Tony always maintained an interest in the band, even bailing us out in New York when we couldn’t afford the hire of our backline for our 1982 East Coast tour. Morrissey used to hang out at the New Hormones offices; he was a big fan of Ludus. I remember him giving Richard a cassette of his poetry, interspersed with New Hormones label acts, (he liked “Spare Concern”, from Dislocation Dance’s 8 track EP). His poetry was a spoken version of his later approach to Smiths vocals. I have to say that Morrissey seemed so shy, that we just left him sitting in the corner and no one spoke to him. Tim Booth (frontman in James) was just the vegan fella in the ground floor flat below Factory’s offices on Palatine Road. We gave him a lift back from a Leeds, after we’d supported Orange Juice and our paths kept crossing over the following decade. James had their offices next door but one, to mine, in the late ‘80’s, when I’d become a label (Bop) rather than a gigging band. I used let James use our photocopier. One of my bands, The Man From Delmonte, lent them a guitarist, who ended up being a permanent fixture, (Saul), closely following by Andy, who still tours with them, as we speak. SPAZ: By the time your second album, Midnight Shift, was released, you had added a semi-full time female vocalist to the line-up. The band seemed more focused than ever. Did writing for another voice appeal to you? IAN: I’ve always thought of myself as a writer, rather than a singer. I like writing songs for women. The range and dynamics of a woman’s voice is so different to anything I can achieve and, of course, I can experiment with the sentiment. Mind you, for the song “Here Comes Love” from Midnight Shift, I imagined I was a 1940’s crooner. I wanted Sinatra to sing it. SPAZ: Why did you end up calling it quits in ’86? IAN: I thought it was time for either a major deal, or set up my own label. I was writing songs with a vocalist called Sonja, who had a lovely soulful, jazzy voice, with great range and amazing phrasing. She reminded me of Cory Day, the Savannah Band’s vocalist and had a real presence. We did a few return visits to the usual suspects, however the lyrical subversion, (there was songs about child abuse and female contraception as a form of oppression), plus my usual slightly eclectic musicality probably made us a marketing challenge. So, I then moved into being a manufacture, (of cassettes, for the likes of Womad), and a label; indie, world and dance. That was certainly fun. We got to release James, Inspiral Carpets, 808 State, A Guy Called Gerald and The Man From Delmonte. 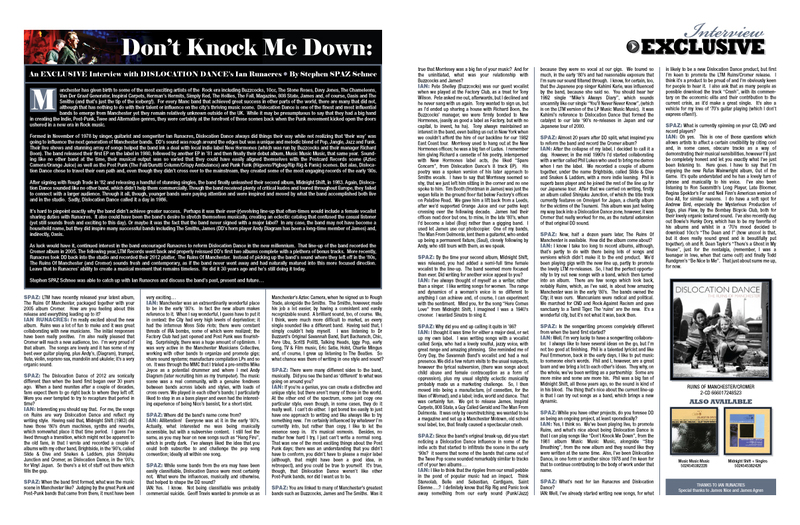 It was only by overstretching; we wanted to be a magazine and set up a Manchester Motown, old school soul label, too, that finally caused a spectacular crash. IAN: I like to think that the ripples from our small pebble in the pond of popular music had an impact. Think Stereolab, Belle and Sebastian, Cardigans, Saint Etienne….? I definitely know that Rip Rig and Panic took away something from our early sound (Punk/Jazz) because they were so vocal at our gigs. We toured so much, in the early ‘80’s and had reasonable exposure that I’m sure our sound filtered through. I know, for certain, too, that the Japanese pop singer Kahimi Karie, was influenced by the band, because she said so. You should hear her 1992 single “Mike’s Always Diary”, which sounds uncannily like our single “You’ll Never Never Know”, (which is on the LTM version of the LP Music Music Music). It was Kahimi’s reference to Dislocation Dance that formed the catalyst to our late ‘90’s re-releases in Japan and our Japanese tour of 2000. SPAZ: Almost 20 years after DD split, what inspired you to reform the band and record the Cromer album? IAN: After the collapse of my label, I decided to call it a day. However, in the mid 1990’s I’d started collaborating with a writer called Phil Lukes who used to bring me demos when I ran the label. We recorded a couple of albums together, under the name Brightside, called Slide & Dive and Snakes & Ladders, with a more indie leaning. Phil is superb bass player and he joined the rest of the line up for our Japanese tour. After that we carried on writing, firstly an album called Shinjuku Junction, of which the title track currently features on Omoiyari for Japan, a charity album for the victims of the Tsunami. This album was just feeling my way back into a Dislocation Dance zone, however, it was Cromer that really worked for me, as the natural extension of that original DD sound. SPAZ: Now, half a dozen years later, The Ruins Of Manchester is available. How did the album come about? IAN: I know I take too long to record albums, although, that’s partly to do with there being lots of songs and versions which didn’t make it to the end product. We’d been playing gigs with the new line up, partly to promote the lovely LTM re-releases. So, I had the perfect opportunity to try out new songs with a band, which then turned into an album. There are few songs which look back, notably Ruins, which, as I’ve said, is about how amazing Manchester was in the early ‘80’s. The bands owned the City; it was ours. Mancunians were radical and political. We marched for CND and Rock Against Racism and gave sanctuary to a Tamil Tiger. The ‘ruins’ are the now. It’s a wonderful city, but it’s not what it was, back then. SPAZ: Is the songwriting process completely different from when the band first started? IAN: Well, I’m very lucky to have a songwriting collaborator. I always like to have several ideas on the go, but I’m not too good at finishing. Phil is a talented lyricist and like Paul Emmerson, back in the early days, I like to put music to someone else’s words. Phil and I, however, are a great team and we bring a lot to each other’s ideas. They why, on the whole, we’ve been writing as a partnership: Some are more mine and some are more his. Phil was a big fan of Midnight Shift, all those years ago, so the sound is kind of in his blood. The thing that’s nice about the current line-up is that I can try out songs as a band, which brings a new dynamic. SPAZ: While you have other projects, do you foresee DD as being an ongoing project, at least sporadically? IAN: Yes, I think so. We’ve been playing live, to promote Ruins, and what’s nice about being Dislocation Dance is that I can play songs like “Don’t Knock Me Down”, from the 1981 album Music Music Music, alongside “Stop Breathing”, from the new album and they sound like they were written at the same time. Also, I’ve been Dislocation Dance, in one form or another since 1978 and I’m keen for that to continue contributing to the body of work under that name. SPAZ: What’s next for Ian Runacres and Dislocation Dance? IAN: Well, I’ve already started writing new songs, for what is likely to be a new Dislocation Dance product, but first I’m keen to promote the LTM Ruins/Cromer release. I think it’s a product to be proud of and I’m obviously keen for people to hear it. I also ask that as many people as possible download the track “Crash”, with its commentary on the economic elite and their contribution to the current crisis, as it’d make a great single. It’s also a vehicle for my love of ‘70’s guitar playing (which I don’t express often!!). SPAZ: What is currently spinning on your CD, DVD and record players? IAN: Oh yes. This is one of those questions which allows artists to affect a certain credibility by citing cool and, in some cases, obscure tracks as a way of demonstrating their musical sensibilities, however I’ll just be completely honest and let you exactly what I’ve just been listening to. Here goes. I have to say that I’m enjoying the new Rufus Wainwright album, Out of the Game. It’s quite understated and he has a lovely turn of phrase and musicality to his voice. I’ve also been listening to Ron Sexsmith’s Long Player, Late Bloomer, Regina Spektor’s Far and Neil Finn’s American version of One All, for similar reasons. I do have a soft spot for Andrew Bird, especially the Mysterious Production of Eggs, plus Flaw, by the Bombay Bicycle Club, both for their lovely organic textured sound. I’ve also recently dug out Bowie’s Hunky Dory, which has to be my favorite of his albums and whilst in a ‘70’s mood decided to download 10cc’s “The Dean and I” (how uncool is that, but it does really sound great and is beautifully put together), oh and R. Dean Taylor’s “There’s a Ghost in My House”, just for the nostalgia, (remember, I was a teenager in love, when that came out!) and finally Todd Rundgren’s “Be Nice to Me”. That just about sums me up, for now.